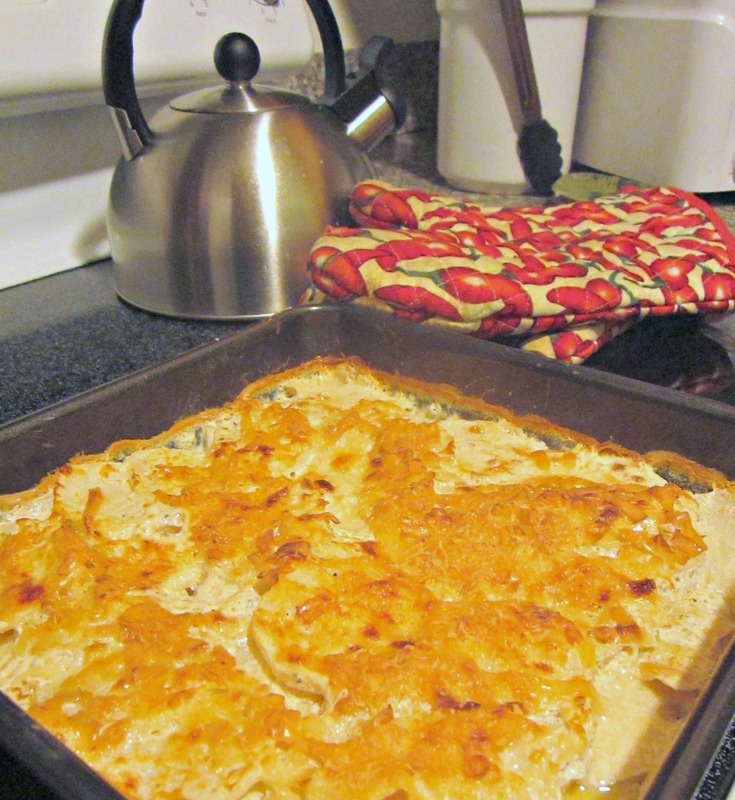 Scalloped Potatoes and a Call for Recipes! 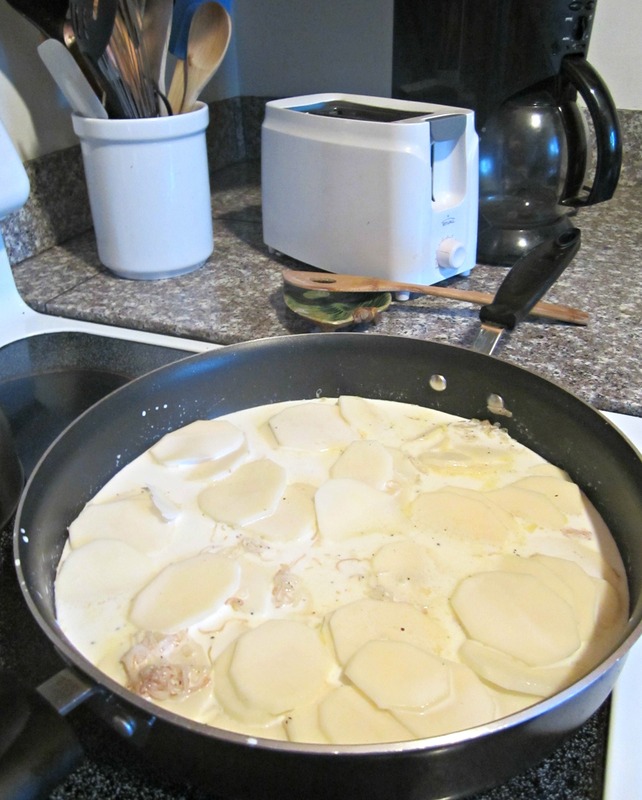 I’ve always thought scalloped potatoes were one of life’s great comfort foods. Creamy and rich, a nice texture contrast between the crunch cheese on top and the soft and sweet potatoes within-everything I want in a potato dish. I’ve been waiting to make this dish for quite some time but my concern was that my potatoes would be uneven and hard and, especially with my Polish heritage, unsatisfactory potatoes would not do! All those potato concerns fell away once my new mandoline entered the scene. I am now firmly convinced that all foods should be cut with a mandoline, if simply because it’s so stinkin fun! I got mine for under $20 at Williams and Sonoma and it even comes with a grip for when the veggies get small so that you don’t slice up your hands. So here’s to new culinary adventures and delicious potatoes! If you have a great recipe that uses a mandoline, let me know and I’ll feature it on Messy Kitchen Happy Belly! 1. Peel and slice potatoes, place slices in a large bowl with cold water for at least 5 minutes. This step will wash off the excess starch so that you don’t get gummy potatoes. 2. In a large pan over medium heat, melt margarine and saute shallots for 2 minutes. Add garlic and saute for an additional minute. Preheat oven to 375 degrees. 3. Drain potatoes, pat dry and add potatoes to shallots and garlic. Add spices, mix well so that the spices cover the potatoes. Increase heat to medium-high and add half-and-half. Cook potato mixture for 8 minutes until potatoes are just starting to soften. 4. Spray 9×9 baking pan with non-stick cooking spray. Remove potatoes from heat. Place 1/2 of potato mixture into the baking pan. Sprinkle 1/2 of the grated cheeses on top of that first potato mixture. Place remaining potato mixture on top and top with remaining cheese. 5. Bake at 375 degrees for 35 minutes. 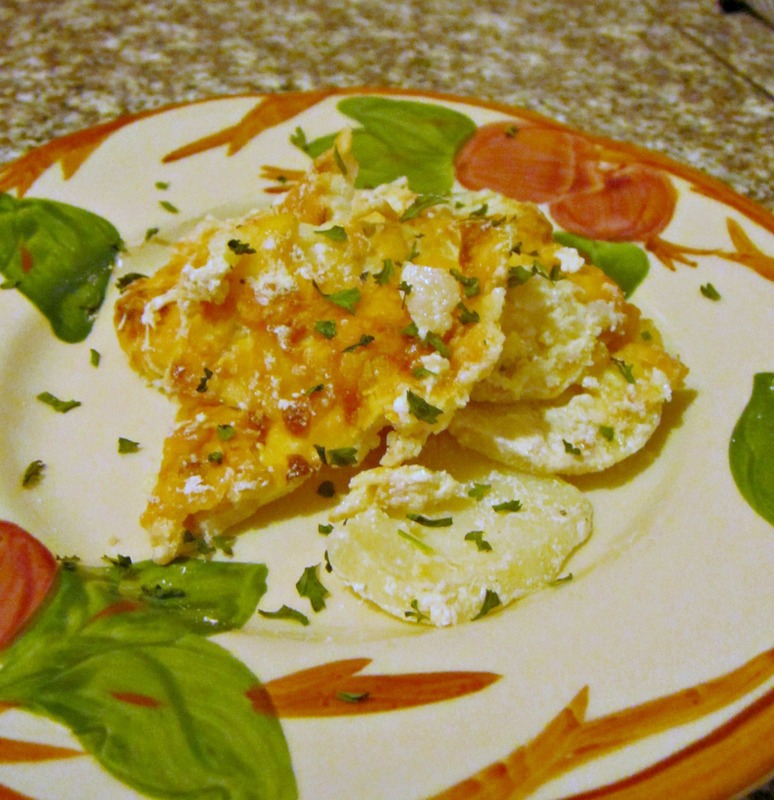 Once baking is completed, broil for 2-5 minutes until cheese turns a golden color. Garnish with parsley if desired.